In this second part of the two-part guest post by Steve Dudley, Chief Operations Officer of the British Ornithologists Union (BOU), he discusses how individuals and society publishers can use online channels to enhance their research communications. Read part 1 ‘Social media mentions deliver citations of research articles’ here. The BOU is 160 years old. Like many, particularly older, societies, adapting to the fast-changing worlds of science, journal publishing and society as a whole, is both daunting and difficult. The BOU is a small learned society with around 1,250 members globally publishing a single journal, IBIS, with an impact factor of 2.297 (2016) and ranked 2/24 in ornithology. Our actual society size belies the size of our global ornithology community as seen by our social media presence (Fig. 3). Figure 3. 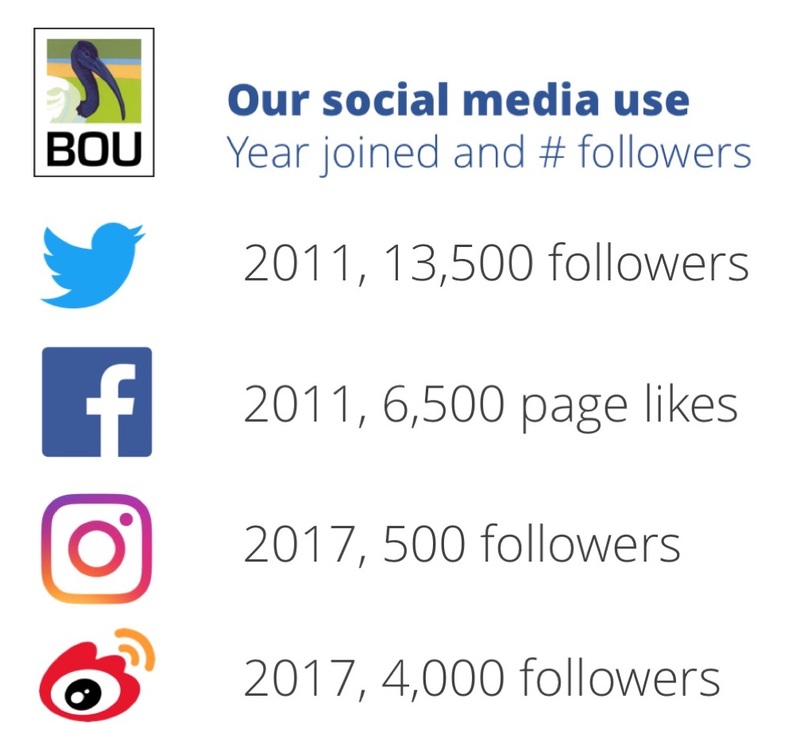 The BOU’s social media use – year joined and number of followers. Twitter is the largest contributor to ornithology articles’ altmetrics, Facebook a minor contributor; Instagram and Weibo do not count towards altmetrics. Like many small societies, our resources are very limited and come largely from our small membership and income from our journal. We are therefore very careful about where and on what we spend these finite resources. The digital age has allowed societies to reduce some costs with better use of online communication. Even so, for small societies, this has not been as marked as people think with the main saving being the switch from costly printed postal communication to members, to digital delivery. Social media, however, enables us to widen communication at the society level as well as broaden the promotion of ornithology as a whole to a larger audience than we were previously able. The BOU has continued to grow its online presence including across social media (Fig. 3). We use social media and other tools to not only promote ornithology to the widest possible audience but to promote ourselves as an active and dynamic society and to drive people to our website. Social media is key to this and now accounts for >20% of our overall society website traffic (<5% in 2013). We’ve similarly grown traffic to our journal (IBIS) website, and at the end of 2016 social media accounted for 7.5% of traffic (1.5% in 2013). More recently we combined our social media skills and our experience of running conferences to run our first Twitter conference. Our largest two-day face-to-face event had around 60 presenters and 200 delegates. Our recent two-day Twitter conference had 67 presenters and an audience of over 3,000 people with a potential reach of 4.5 million. Twitter conferences deliver other benefits too – they are more inclusive and diverse allowing people from all around the world to take part, people who would otherwise not be able to attend a face-to-face event; and with all the presenters and audience taking part from wherever they were at the time, Twitter conferences are also very environmentally friendly! I think there are fewer more important roles a society can have than to educate its research community about changes in their field, including areas such as communicating their own science for themselves. Most scientists that have not yet taken to social media are either skeptical or ask why have they not joined in the conversation earlier. One test I use is to ask someone how many profile views they get on sites like ResearchGate, or their online department profile. It’s usually in the tens at best for the last month. My Twitter profile views average around 2,500 a month! Over the last five years, the BOU has managed to combine new technologies and media with traditional society activities and should act as an example of how a small society can adapt and prosper in the new digital and social age. Don’t be afraid! Study’s such as our own (Finch et al 2017) are contributing to a growing body of evidence in a language that scientists themselves can understand. The benefits of communicating science on social media are becoming increasingly clear at the individual researcher, community society, journal publisher and, wider societal levels. Funding bodies are also paying increased attention to science communication, in particular, altmetrics, as this provides them with a ready-made indicator of the attention a piece of published research has attained. 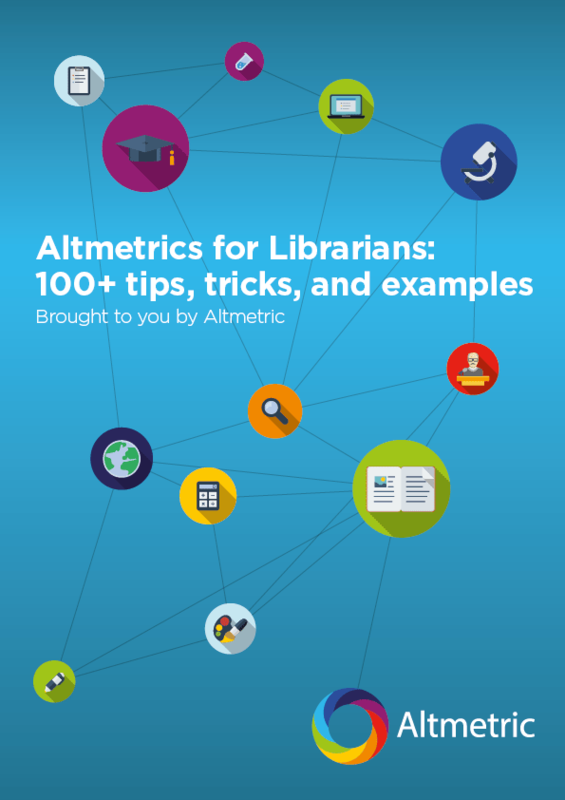 As this new metric matures and becomes both better understood and trusted, it will provide funders with evidence of which of their spending reached a wider audience. This may be a crude way of viewing science funding, but since much of the money scientists spend comes from the taxpayer, it’s a measure funders can use themselves to better explain their funding practices. Science communication isn’t for everyone. I’ve long said that some scientists shouldn’t go near it – they simply aren’t good at communication. That’s fine. I’m not much cop at many things either, and I leave them to others (like the analysis for our paper). But that should only serve to encourage researchers to broaden their search for collaborators that can bring in different skills to their research or paper, including individuals in their field who are good at communication and in particular, know how to get the best out of social media to promote their research. Given the academic, community and wider societal benefits of promoting your research can have, there are several ways in which an individual can publicize their work online. Twitter is the most important being the largest contributor to ornithology altmetrics, and arguably being the easiest way to share links to published articles online. All of these easy to do activities are covered in more detail in our paper, and in my series of blogs. With all the energy and time that you put into your research, publicizing and promoting your published ornithology article should be viewed as equally important with benefits to the individual, science community and wider society through outreach, education and conservation. We educate our ornithology research community using our blog (#theBOUblog). I have penned a series of articles highlighting the benefits of using social media to promote research, and how best to do it (e.g. which platform to use, Twitter masterclass series). All our social media online resources can be accessed via the BOU website ‘Social media – bringing it all together’ page. About the author: Steve has spent much of his 30-year career communicating science at different levels. He has run the British Ornithologists’ Union (BOU) for over 20 years and is responsible for delivering most of the society’s activities including all social media and communications. His recent focus has been on peer-to-peer communication, educating his research community about the benefits of using media and in particular about altmetrics.